A newlywed couple and their bridal party were serenaded by a Chicago police officer as their bus stopped to take photos. CHICAGO (WLS) -- A newlywed couple and their bridal party were serenaded by a Chicago police officer as their bus stopped to take photos. 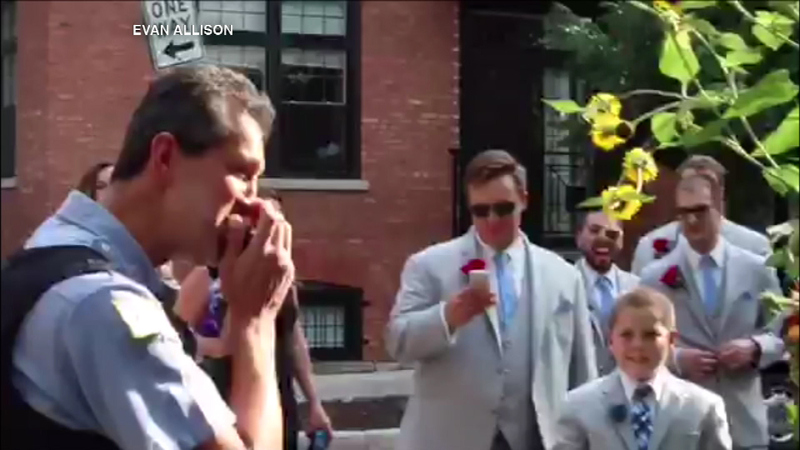 When the officer pulled up behind them they got worried they were getting a ticket, but instead of pulling out his ticket book, the officer grabbed his harmonica and played a quick tune to toast the newlyweds. The wedding party was taking photos in front of a community garden in Wicker Park.